Sequim traffic is one of the reasons people move to Sequim, or perhaps I should say the lack of traffic. If you have been driving the I-5 Corridor around the Seattle-Tacoma metro area, or you’ve been driving for years on the Los Angeles freeway system (I-405 or I-15 or I-5), you are probably ready for a change. How about living where a traffic jam is considered 5 cars in a row? Imagine your stress level dropping by 98% because of Sequim traffic. That’s what happens when you get out of the concrete jungle and away from bumper to bumper rush hour traffic. This photo was taken at an intersection on our only freeway, Highway 101 on the west side of Sequim. First, notice in the middle of the day there are no cars, either on the side road or the freeway. Second, we have well maintained roads. But there’s another important reason I am sharing this if you are thinking about buying a home in Sequim or Port Angeles or Port Townsend. Recent expansion of Highway 101 on the west side of Sequim revealed an entirely new concern for buyers. If you live on Dryke Road, for example, and you want to turn left onto Highway 101 toward Sequim, you must first turn right and west toward Port Angeles. You drive about an eighth of a mile and use a turn-around to head back east to Sequim. This may not sound like a big deal, but if you drive to town once a day, it is annoying. We used to be able to simply stop at the intersection and turn left toward Sequim, but freeways and the new rules of access have changed all that. Sequim traffic is now subject to special highway laws and regulations. These new turn-arounds effect many roads in the area, but at least we don’t have much Sequim traffic. If you’re a buyer, you will want to pay attention to highway access from your prospective home. There are areas where the access is annoying or even unsafe. The intersection of Palo Alto and Highway 101 is dangerous. 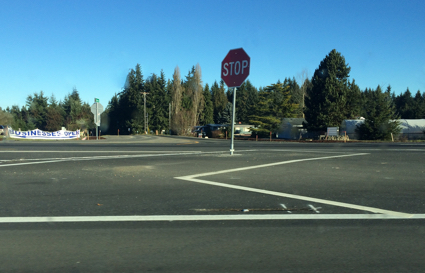 The intersection of Dryke Road and Highway 101 is annoying. You may not know all the Sequim traffic issues, but it’s worth knowing before you buy. Your friendly Realtor should know Sequim traffic.